Entry: Ants can enter your home through even the smallest of cracks, they often seek water and sweet or greasy food particles in kitchen pantries or storeroom areas. Scent trails: Once food sources are located by the ants they leave an invisible chemical trail which contains pheromones for other ants to follow. Nest locations: Ants can nest almost anywhere in and around your home in places such as lawns, walls, stumps, attics, and under foundations. Colony size: Ant colonies range in number up to 300,000 to 500,000, and entire colonies can quickly pick up and relocate when threatened. Colony Lifetime: A colony of ants can live for long periods of time. Worker ants can live up to seven years, and queen ants can live up to 15 years or more. Do-it-yourself Failure: In most cases where do-it-yourself approaches are taken in attempt to control ants, only the ants you see are killed and the colony typically moves to another safe place in or around your home. However using the right treatment can effectively penetrate and destroy the ant colonies and nests to help prevent ants from returning, different kinds of ant infestations require different customized treatments, which is why it is always best to contact us to have a professional ant treatment completed. The ant life cycle contains four distinct stages: egg, larvae, pupae and adult. The completion of these stages is called metamorphosis. In general it can take several weeks to several months to complete the life cycle, depending on the ant species and other environmental factors. A female ant that successfully mates with a male ant will become a queen ant that lays eggs. Fertile queens select a sheltered place to begin a nest (colony) and begin laying eggs. Ant eggs are very small – only about a half of a millimeter in diameter. The eggs are oval, white and transparent. After about 1-2 weeks in the egg stage, a legless ant larvae hatches. During this stage the larvae has a large appetite, and the adult ants spend much of their time feeding the larvae with food and liquids they digest and regurgitate. After the larvae molt and shed their skin, they grow into the pupal stage. Pupae appear somewhat like adults ants except their legs and antennae are folded and pressed against the pupal body. Initially, ant pupae are usually white, but slowly become darker in color as they age. Depending upon the ant species, pupae may be housed in a protective cocoon. Once the pupal stage is complete, the ant becomes an adult. At the time of emergence, the adult ant is fully grown, but darkens in color as it ages. 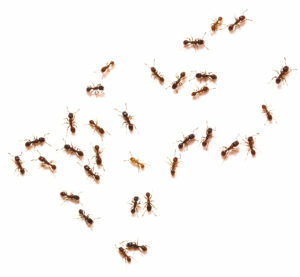 Adult ants are one of three different colony castes; queens, workers or males. Queens are fertile females that lay all the eggs in a colony. Workers are females that do not reproduce, but do gather food; feed the larvae; and maintain and clean the nest. Workers are wingless, and it is the worker stage that is seen foraging around for food or defending the colony from intruders. The male ants are winged, but their only job is to mate with the queens during the swarming process.